So, over the next couple of years, Illinois residents may very well be benefitting directly from some of the discoveries coming out of our own Northwestern’s labs! Lucky for Illinois, Northwestern is not the only research institute doubling down on clean energy. The Illinois Institute for Technology (IIT) in Chicago has an impressive microgrid which saves them about $1 million every year in energy costs and also cuts their carbon emissions, according to the Chicago Tribune. Recently, IIT and ComEd announced they would work together on a new microgrid cluster project in the Bronzeville neighborhood of Chicago. 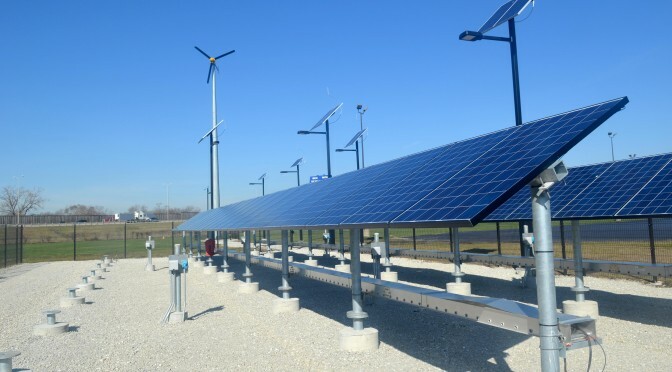 And, of course, if you’ve been reading the blog regularly, you probably already know about electrical union IBEW Local 134’s renewable energy training field in Alsip, Illinois, where electricians learn about installing and maintaining several types of renewable energy systems, including solar arrays and wind turbines. Each of these projects is important not only because they help innovate greener energy solutions, but also because they are growing the clean energy economy in Illinois, opening up the potential for more jobs and training for Illinois residents. We think that’s pretty exciting and we hope you do too! Know of another green energy training program? Tell us about it in the comments section below. Or, reach out to us on Facebook and Twitter.